The global pulmonary drugs market is highly competitive in nature with a few products dominating the overall market, states a new research report by Transparency Market Research. The leading players in the market are expected to lose their share to certain extent as patents of several drugs are going to expire in the next few years. In order to maintain its position and market share, the key players are focusing on building their drug pipelines and enhancing developing result-oriented and effective medicines in order to meet the unmet demand of the patients worldwide. Some of the key players operating in the pulmonary drugs market across the globe are Boehringer Ingelheim GmbH, GlaxoSmithKline Plc., Astra Zeneca, Teva Pharmaceutical Industries Ltd., and Merck & Co., Inc.
As per the market research study published by Transparency Market Research, in 2015, the global market for pulmonary drugs market was worth US$ 48,039.7 mn and is predicted to reach a value of US$ 28,082.1 mn by the end of 2024. The market is anticipated to register a -6.30% CAGR between 2016 and 2024. 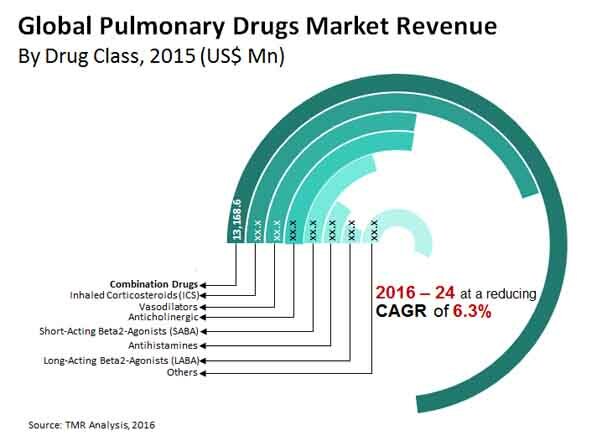 On the basis of geography, the global pulmonary drugs market has been classified into the Middle East and Africa, Latin America, North America, Europe, and Asia Pacific. As per the report, in 2015, the North America market accounted for a share of 41% of the global market and is expected to remain in the leading position throughout the forecast period. North America is expected to be followed by Europe in the next few years. The development of the advanced healthcare infrastructure and the rising awareness among people regarding the availability of pulmonary diseases. On the flip side, a significant rise in the income of middle-class people and their willingness to spend on advanced healthcare is projected to accelerate the growth of the pulmonary drugs market in the coming few years. On the basis of drug classes, the global pulmonary drugs market has been categorized into anticholinergics, combination drugs, short acting beta2-agonists, antihistamines, vasodilators, long-acting beta2-agonists, inhaled corticosteroids, and others. The combination drugs segment held a large share of the global market in the last few years and is projected to remain in the leading position throughout the forecast period. The high growth of this segment can be attributed to the fact that combination drugs are considered safe in comparison with other drugs. In addition to this, the advent of triple combination drugs is likely to generate promising growth opportunities throughout the forecast period. The demand for pulmonary drugs, despite the expected decline is likely to rise with the increasing prevalence of chronic respiratory disorders. A tremendous rise in the number of smokers around the world is also considered as a major factor estimated to accelerate the growth of the pulmonary drugs market in the next few years. In addition to this, the research and development activities and the awareness programs being conducted by government across the globe are estimated to encourage the growth of the market in the coming years. Increasing number of smokers across the globe resulting in respiratory diseases is projected to encourage market growth. North America to lead global pulmonary drugs market and is expected to be followed by Europe and Asia Pacific.